Folque's debut album with the name Folque has everything I could need from music so it's impossible to not acknowledge it. I love folk music and think that folk obtained some form of perfection in the sixties and seventies. Then came some bands on Ireland, "The Dubliners" and "Wolfe Tones" and made folk music popular. In Sweden Jan Johansson's jazz interpretations of folk music were successfull too. Then came the electric folk with magic bands like Fairport Convention and Steeleye Span. Since I was fifteen, Steeleye Span has been one of my favourite bands that exist. In Sweden an acoustic duo made folk popular as well, called "Folk & Rackare" and they are totally awesome too. 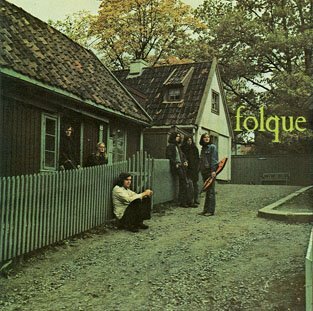 "Folque" here merge together some of the best aspects of folk and rock music. They continue the folk tradition with anciant ballads and melodies. The songs are sung with a sweet female voice, quite similar to Carin Kjellman of Folk & Rackare's. The songs are played with a warm and partially electric style in Fairport Convention style. The bass play is similar to Steeleye Span's and on this record they play a Norwegian verison of Steeleye Span's "Alison Gross" too. When I record contains inspiration from so many of my favourite bands, the result should be a success, and it is. Wherefore? Because Folque also does something of their own here. The music is truely Scandinavian and it is so right. A perfect balance are also the premise for the success. It is not too electric and heavy and not too pure traditional. People could argue if the music is prog, I don't care, the beautiful pretentions do qualify this record to be discussed here. 1974 was this, Folque's first record released and it contains twelve wonderful tracks. The vocalist Lisa Helljesen, the violinist Trond Villa, the guitarist/mandolinist Morten Bing, the vocalist/guitarist/dulcimerist Jörn Jensen, the banjoist/bassist/guitarist Eilif Amundsen and the bassist/pianist Trond Överland have we to thank for this music. We can see them on a street on the beautiful cover. Every song on the record is beautiful but they are listed incorrect at this site. This is the correct order: 1)Skjön jomfru(10/10), 2)Ravnene(10/10), 3)Springar(9/10), 4)Sjugur og trollsbrua(10/10), 5)Nissedans(10/10), 6)Harpa(10/10), 7)Sinclairvise(9/10), 8)Reinlender(10/10), 9)Alison Gross(9/10), 10)Steffa går til Selfjord(8/10), 11)Reven op björnen(9/10), 12)Heimat låta(8/10). As you see the majority of these songs are as good I think music can be. Within the music style's own perfectional limits it's as good as it can be, and the rest are close to perfection as well. "Skjön Jomfru" have I read, is the same song as Fairport Convention's "Matty Groves". That song and "Harpa" together with "Ravnene" and "Nissedans" are so lovely that you can't hear them to many times. It's a mystery for me that Folque's records have got so low ratings. I guess some progers don't think folk rock is rocky enough. I hope they'll change their minds. It's worse to play too heavy than too soft. "Folque" is heavenly music to me! Five stars!